Community Blog by nekobun // Thank you, for bringing me here, for showing me Home. Benjamin Rivers' Home is a game that didn't see the most timely release. 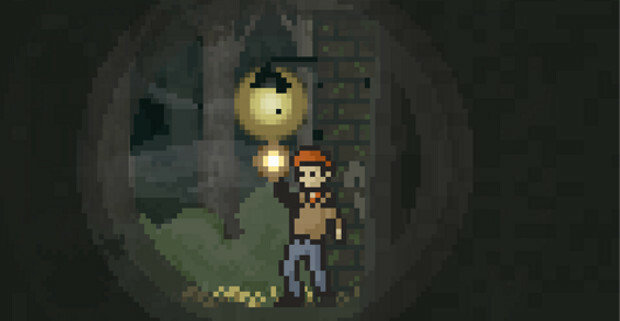 Rolling out, originally, at the beginning of June, Home's 2-D, low-res, sprite-based horror risked some overshadowing by the long-awaited Lone Survivor, which finally appeared a couple of months beforehand. With Halloween upon us, Home has been seeing a bit more scrutiny, being featured in both Indie Royale's Halloween bundle, and thereby has had a chance to prove itself vastly different from Jasper Byrne's long-awaited opus. Whereas Home is not the prettiest game out there, its retro feel is consistent throughout, which lends itself to the open-ended storytelling and how much the game leaves to the player's imagination, both in interpreting immediate circumstances and filling in the blanks in regards to the overall plot. As I proceed, be warned that there may be some mild spoilers ahead, though again, the game's events lend themselves to a great deal of interpretation, and would seem to differ based on the many choices you're given over the game's course. Any reveals will hopefully be kept to unavoidable, non-surprise incidents, though let it be known that I played through saying "Yes" to pretty much every choice, for fear of missing something I needed to progress later on. As for my interpretation of the game's events, worry not; I'm keeping that for someplace else, which I'll get to later. Moving on. Home starts by waking you up in a strange room in a stranger's house on a dark and stormy night, as many a horrific tale tends to. Turns out that stranger is a bit on the dead side, there's reasonably fresh blood in several areas of the house, and you don't recall how or why you're there in the first place. How convenient. Your investigation takes you through the rest of said house, some dubious underground tunnels that eventually link up to the sewer system, the factory where you used to work, a forested park, your old buddy Norm's shop and apartment, and finally to your own neighborhood and titular home itself, all the while collecting (or electing not to collect) clues that may help clarify what's going on. Of particular import are the discoveries of various murder victims and the weapons that likely murdered them, though it's mostly left up to the player to figure out who did the murdering. The game doesn't actually telegraph that very well, so there are bits where it seems like you're just doing busywork to proceed, and when the game's ending is wrapped more in the main character's reflection on events (and your input into his thought process) rather than any solid answers, it may seem like a disappointed when a lot of questions are left unanswered. That is, until a post-credits screen pops up, inviting you to head to a special, "What Happened?" section of the main Home site, where you can share your thoughts as to what occurred in the game. That's when it clicks. That's when you realize that Home is the story you make it, and you weren't having your hand held through a thin, trope-ridden plot the entire time; rather, the gameplay was simplistic at times to let your imagination do the walking, to assemble the puzzle however you choose given whatever pieces you decide to pick up or leave, or even explore enough to find in the first place. Therein lies the brilliance of Home. If you'd like to take a trip Home yourself, it's in the Indie Royale Halloween Bundle with a bunch of other great games until November 2nd, or you can get it on its own for a whopping $2.99 on Steam, either by looking it up yourself or via a link at the game's website. Or feel free to watch my playthrough above, if you'd rather not get your hands dirty. Either way, definitely check out the What Happened page linked earlier if you do finish Home in some fashion, as even if you'd rather not share your own interpretation, there's an interesting spectrum of views to weigh against one's own.